Said note remained in Wilson’s file folder, until 1984 — when he (and his writing partner, Brent Maddock) found a chance to finally bring it to the screen. Having sold the script for Short Circuit, and having been hired by Steven Spielberg to collaborate on the scripts of Ghost Dad and Batteries not Included, Wilson and Maddock were allowed to propose a project of their own. Wilson recalled in an interview with Cinefex: “our agent, Nancy Roberts, sat us down and said, ‘okay, guys, now comes the fun part: for a brief time, anybody will listen to anything you have to say. What’s in your files?’ So Brent and I got together and we picked from each of our files ideas that we had jotted down, including my ‘Monster in the ground’ concept, which at the time was called ‘Landshark’. Nancy loved it and we began working on a twenty-five page treatment.” Long time friend Ron Underwood — with no previous experience in creature features — was attached to direct the project, and also collaborated to the script. 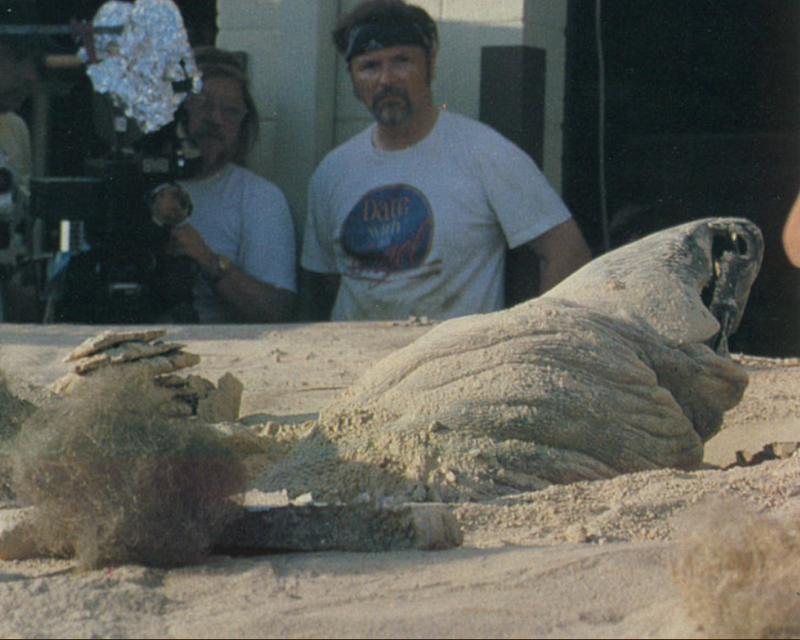 Tom Woodruff Jr. and Alec Gillis pose with the dead Graboid. Then — A HUGE MOUND OF EARTH RISES UP UNDER VAL AND EARL!! The cowboys tumble down its side, Val losing his rifle. They roll over and stare dumbfounded at the mound. The mound of earth turns toward them. The ground splits open and out rises — a huge head! The monster is a horrendous thirty-foot long eating machine! Its head is eyeless, utterly alien, covered with tough boney plates which close together to form a cork-screw point. The cowboys stumble back toward the fence in speechless terror. The creature slides toward them, pushing through the earth like a whale through water. Curiously enough, in fact, worms were not used as reference. “We actually did not look too much at worms because they are very boring,” Gillis said. “We used a ‘form follows function’ kind of thinking. We wanted something that looked like it could come from this planet — or could come from another planet — but it had to be functional and look like it was part of a desert environment. We started off by considering its mode of movement — whether it was a muscular movement or more like a locomotive that could barrel through the ground. For dramatic reasons, Ron liked the latter idea. With that in mind, we went with a heavy armored look rather than something slimy and soft and undulating. The outer surfaces combined the look of a crocodile skin with the leathery dry look of an elephant’s skin — cracked and wrinkled around its points of movement.” Dinosaurs and rhinoceroses were also used as reference. The ‘battering ram’ movement through the dirt (“like killer whales,” as described by Gillis) implied a mechanism that would enable the creatures to propel themselves through the ground; the spines, now distributed on the sides of the torso, became that expedient. 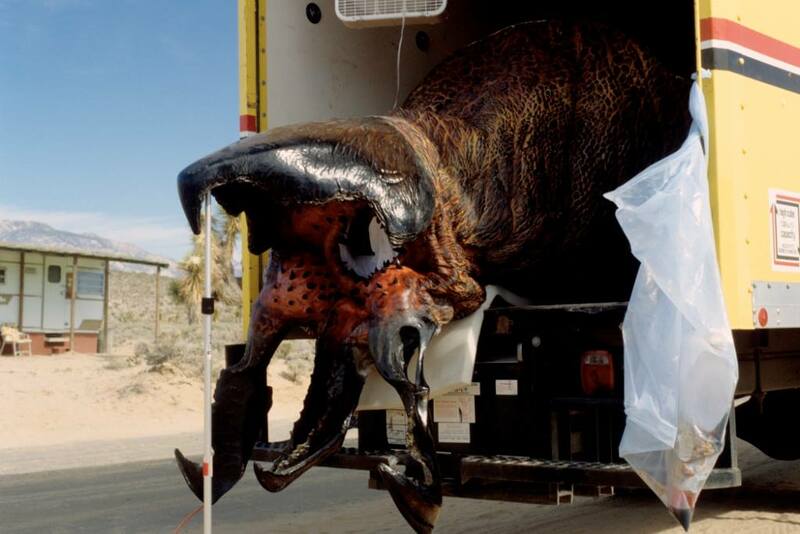 The Graboid animatronic arrives on set. 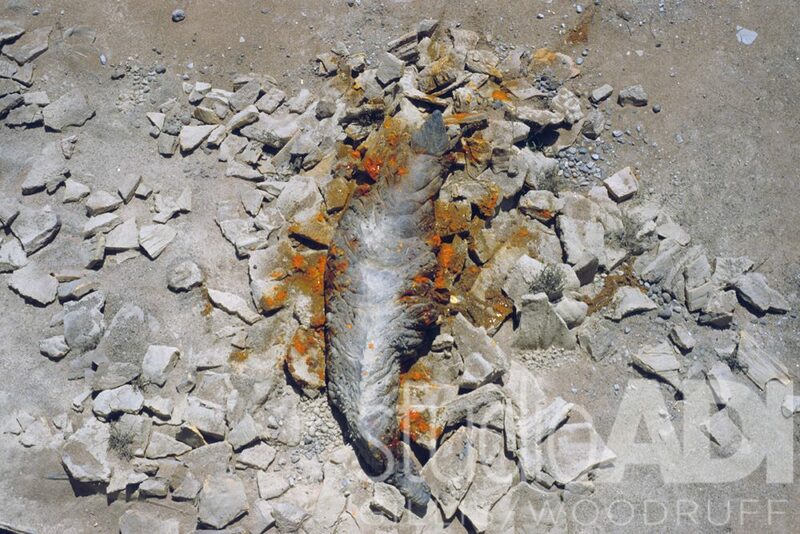 A promotional still of a Graboid tentacle. The design of the tentacles itself went through different iterations — some of which were more ornate and with “almost a flower motif.” The final appearance was mainly inspired by catfishes, with four sensory barbs on the sides of the pseudo-mouth. “We designed the tentacles with a sort of catfish look to them,” Gillis said. “The idea was that they could flatten down and look quite featureless — almost like tongues — until their mouths opened.” Some elements of the design were also inspired by snakes, and the bulk of the surface was based on slugs. 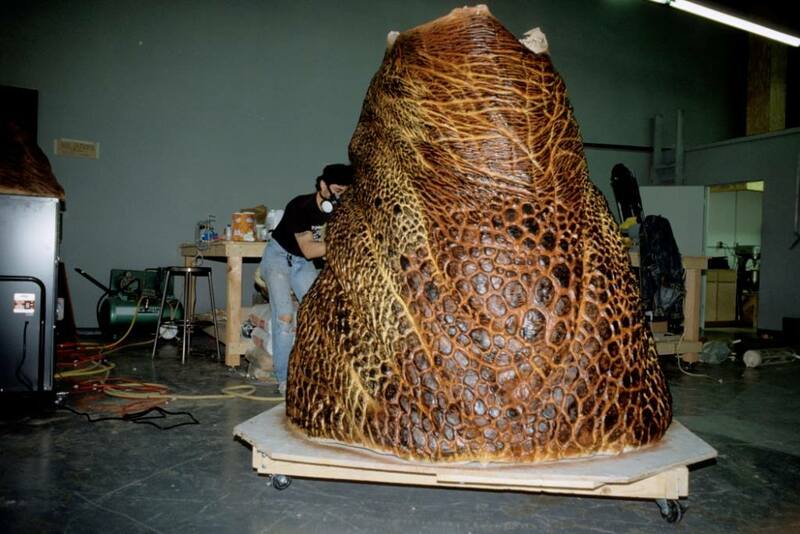 The full-size Graboid dummy’s head. 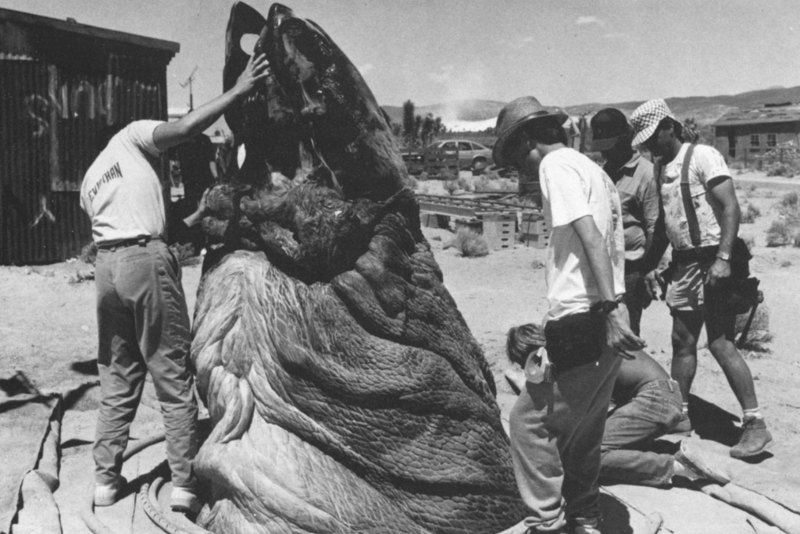 Five full-size creatures were built in total: four head sections and a featureless dummy of the full creature, used in the scene where one of the Graboids, having recently died, is unearthed and analyzed by the protagonists. 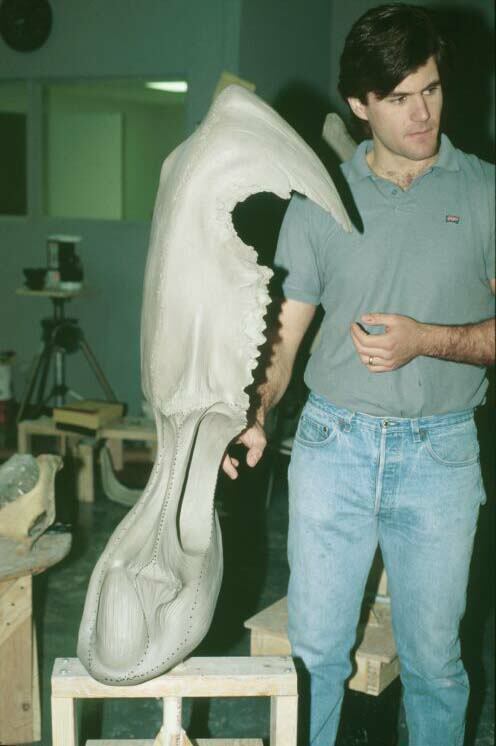 The eight-feet long head sections featured an internal structure composed of appropriately shaped aluminium bands; the skin was cast in foam latex — as opposed to the then commonly used polyurethane. Woodruff explained: “foam latex has a nice, compressed look to it; because the creature was so big, though, we had to build a custom oven — an eight-foot box — to be able to cook these things. Inside the foam latex we did pattern tracings of where the body was wrinkling on the outside; we did that so we could pad up the inside, but still leave divisions where the wrinkles were so that when the skin moved it would naturally fold along the same lines that were already sculpted into the creature.” The head, jaws and mandibles were instead cast in resistant fiberglass, which infused them with the desired plated appearence. All the creatures were painted with primary grey and brown color schemes. The full-scale head sections were mechanized primarily by Craig Caton and Jeff Edwards. 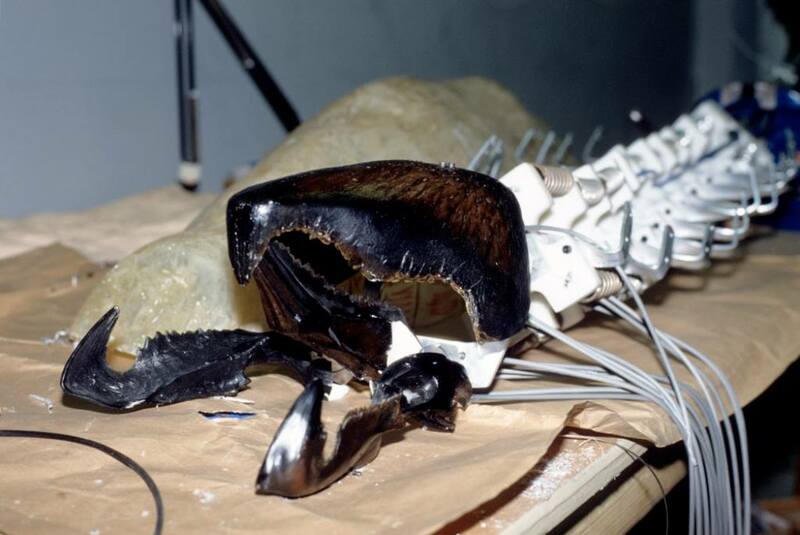 The mobile fiberglass parts were attached to a metal plate and connected to a large spring, which was in turn mounted on a backpack. Depending on the demands of a specific sequence, said backpack could be worn by a puppeteer, or be installed on on one of the rigs devised by physical effects supervisor Art Brewer, who also directed the construction of the shaking building sets for the film and other practical effects. Gillis explained the mechanisms: “the head movements were actuated by four rods that came out from the metal plate like a parallelogram. The rods went back to a T-bar; and whichever way you moved the T-bar, the plate in front would move as well.” The parallelogram mechanism was a modular device that could be “plugged” into the creature. 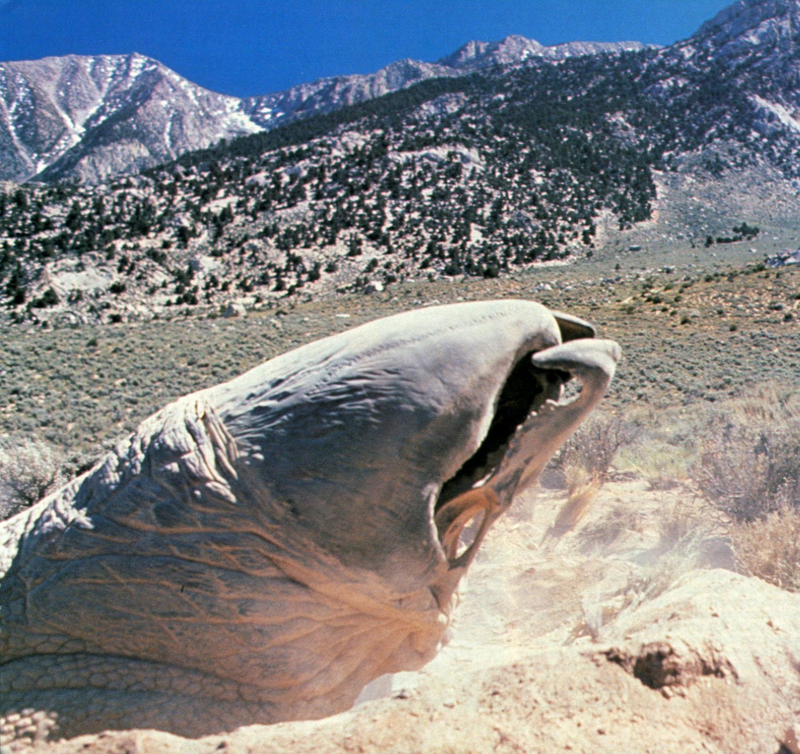 The sequences involving the Graboids bursting out of the ground were among the most complex effects stunts achieved for the film. For these scenes, the controller backpack was worn by a single puppeteer — Woodruff, usually — who was lowered into the ground through an elevator rig. “We built a 10-foot aluminium elevator,” Brewer said, “that was 60 inches in diameter. It was operated by means of pneumatic cylinders — the same kind used by NASA on the space shuttle doors. The cylinders are made in Houston and are very clever high-tech rams run by oxygen and nitrogen. We used them to power the Platform inside the elevator. The prototype Platform had been solid plywood, but we found that it created too much suction when it went up, so we switched over to a grated platform.” The rig was able to move at about 12 miles per hour — even when it carried the weight of the animatronic and the operator. The rig was installed in an 11 feet deep hole with a 10 feet diameter and then covered with a 2-inch-thick piece of styrofoam painted dirt brown. 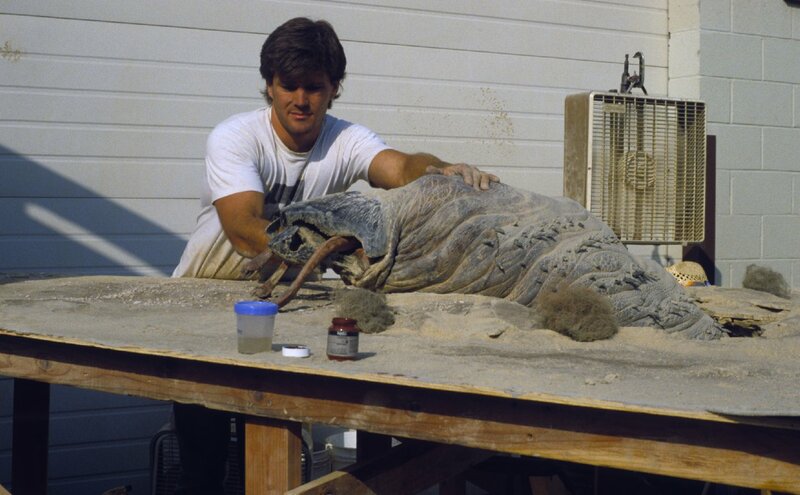 The beak of the Graboid protruded from a pre-cut foam lid, and the entire system was camouflaged with vermiculite and sand. The elevator was operated from the surface and could rise, enabling the creature to erupt from the foam lid. Air hoses enhanced the effect by spewing additional dust. Brewer recalled: “we tested it at our shop before we went out on location and it worked perfectly; but then we got out to Lone Pine where it is all sand and pumice dust — and the wind was blowing constantly and all of that really sabotaged us. We finally found a silicone-based lubricant that the dust would not stick to and that pretty much solved the problem.” The elevator rig was completely self-contained and could be moved from place to place by a crane, to the point where the set-up time (including finishing touches on the creature) was cut down to about 45 minutes. 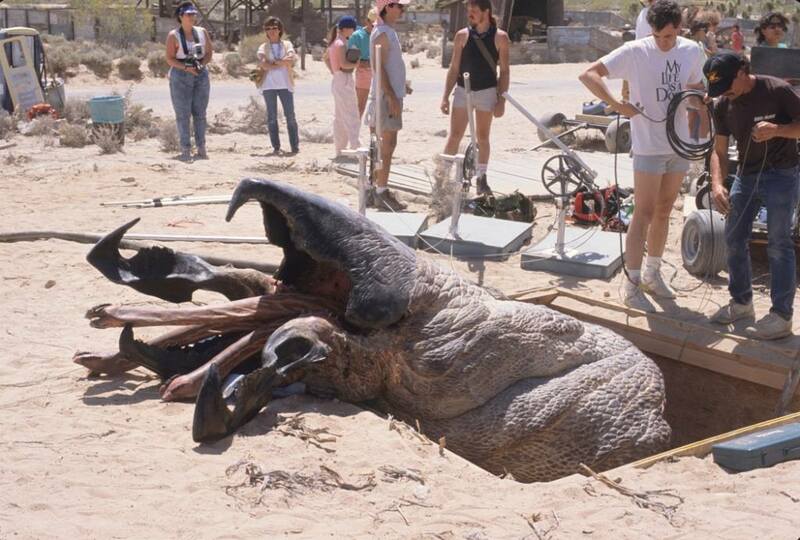 What actually infused life into the movements of the Graboid was the performer himself. Woodruff was positioned inside the elevator pit and lowered 10 feet into the ground, and had to wait for his cue; the experience was not particularly pleasant, as recalled by Woodruff himself: “it was one of the worst things I have done because the creature was so cumbersome and so difficult to move. I had a Watchman monitor inside the elevator to guide me, but it got to the point where I could not concentrate on that. All I could do was move the creature the way I felt it should be moving. It was quite an ordeal — I would strap the backpack on and climb into the elevator, put on goggles and radio gear and a respirator, and then they would drop the elevator down. Because of all the dressing they had to do around the area after the elevator was lowered, I would be down there for about 25 minutes before they were ready for a take. It was a very isolated feeling, even though there was air pumped in and it was very safe. One advantage to it was that it was the coolest spot in the desert. When they were ready to go, I would get into a crouching position and as soon as the elevator went up, I would stand to give it a little extra burst up through the styrofoam piece. Even so, it seemed to move at an agonizingly slow rate most of the time. The sound effects helped and they also minimized it in editing by cutting the shot down so that the creature comes out three feet before they cut instead of eight feet. But the rig moved pretty well. If it had moved any faster I probably would have had the thing crashing around me.” A second elevator rig was built for sequences where characters or objects are dragged in the ground. 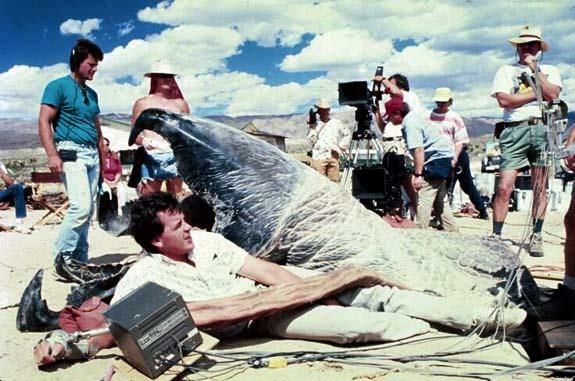 Out of location ground, the Graboid was attached to a different rig — described as a “rolling dolly with an arm”. Brewer explained: “the creature was mounted from a parallelogram and hung from a custom-made crane so that it would stay level as it lunged forward. The rig was all steel, and with the creature in place it weighed about 900 pounds — we had to use 120 pounds of weight to counterweigh it.” The dolly rig was used on location — but was employed most prominently for the interior sequences on stage at the Valencia Studios outside Los Angeles. The first scene was the Graboid bursting through the market floor. Brewer recalled: “for the store scene, we put the dolly on a track and then rolled it forward and raised the creature up as it smashed through the floor — which was made of several layers of balsa wood so the creature could break it apart easily. The rig was manually operated by six people — everyone pushing and moving levers and cables. Two of the guys were operating the creature and they ended up actually riding the dolly.” A prosthetic broken leg provided the effect of the violent dragging, whereas the actor could sit in a seat rigged inside the creature’s mouth. 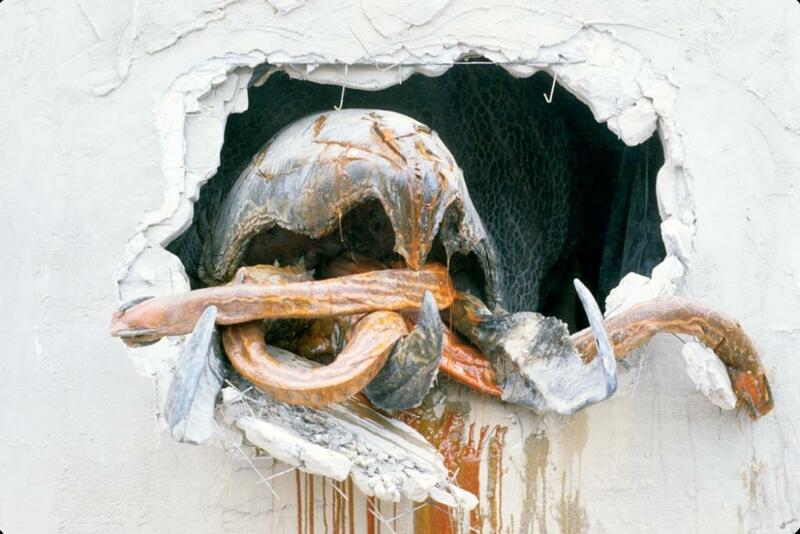 The other scene involved a Graboid ramming through the wall of Burt Gummer’s basement. A similar method was employed — with the addition of a section with dirt and sand that the creature burst through — allowing the visual detail of sand dripping from its head. Gillis also recalled the success of the scene, also determined by the amount of slime used in it. “By the time we got to the point where the dead creature — rammed into the retaining wall — they break it away and the head rolls out, there’s a POV shot where the camera is moving and there’s all this dripping slime. We really went overboard with the wetness there. We saw it at a test screening with a bunch of guys — heavy metal guys, with Metallica T-Shirts — guys that would really eat that up. When they saw all that dripping slime, the roof went off the theater — everybody was cheering. we looked at each other and said, ‘slime. Never underestimate the value of slime’.” The slime was, as usual, achieved with KY jelly. All the life-size creatures could be fitted with the corresponding tentacles, whose movements were inspired by elephant trunks and octopus tentacles. 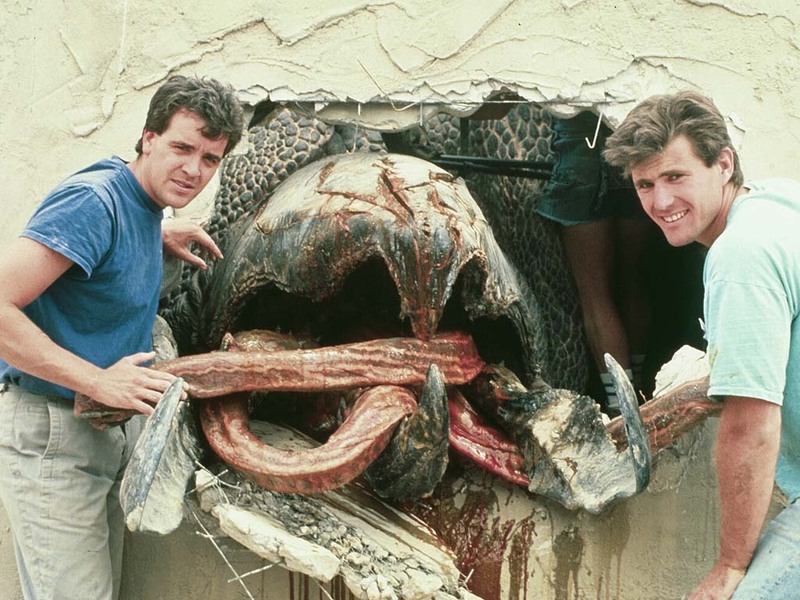 Gillis and Woodruff, supported by crew members Mark Rappaport and Mecki Heussen, built several versions of the tentacles to work in cooperation with the full-sized Graboid heads — as well as insert puppets. 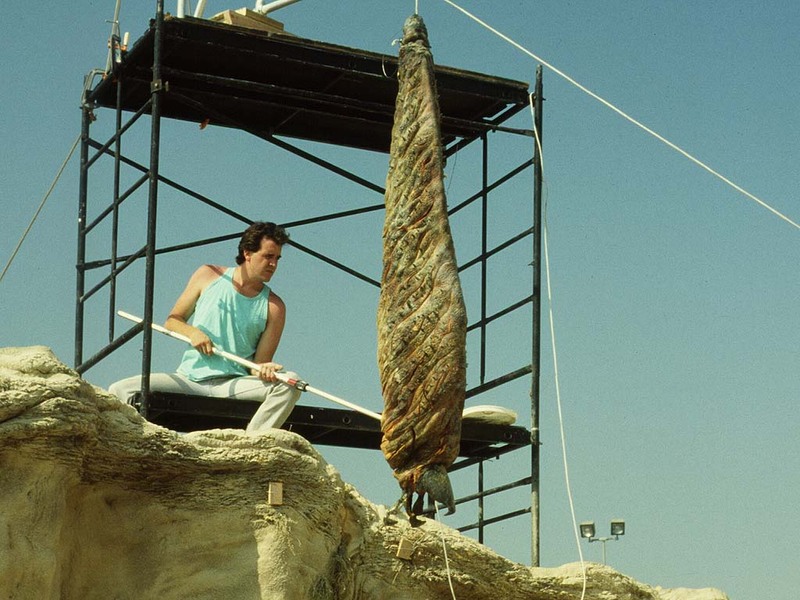 The duo were already familiar with the creation of Monster tentacles; Gillis recalled: “the tentacles on Tremors are the third generation of tentacles that Tom and I have worked on. We did tentacles on Invaders from Mars and Leviathan, so we were able to build on our past mistakes and rectify them. We made three 10-foot-long tentacles that were cable-operated — also a four-foot [tentacle] head section with articulated barbs on the head and chin that would stand up to give it more character in close-up. The spine of the tentacles was braided hydraulic hosing — which flexes any way you want, but does not twist. A lot of our previous efforts had ball joints and other things that would twist on themselves causing loss of control.” The internal structure also employed discs of delrin — a machinable lightweight plastic — that were bolted to the hydraulic hosing “to create a series of ribs.” Cables of bulkheads installed inside the model allowed for several points of articulation. 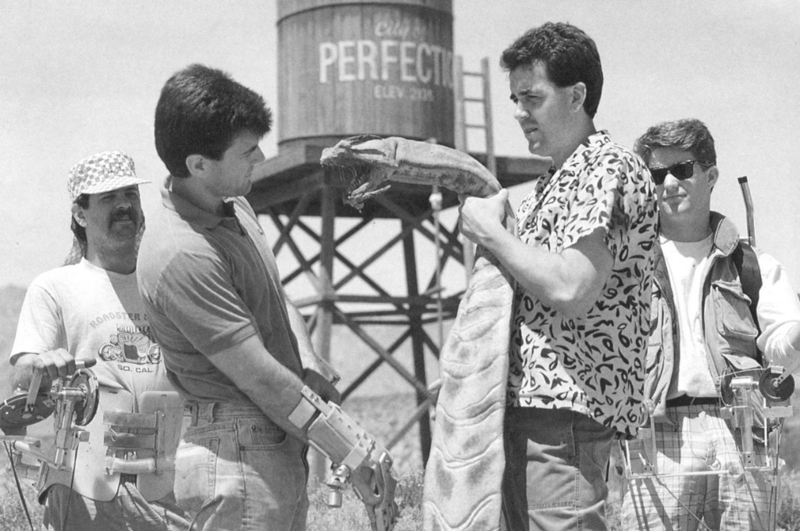 Gillis and Woodruff handle a Graboid tentacle on set. 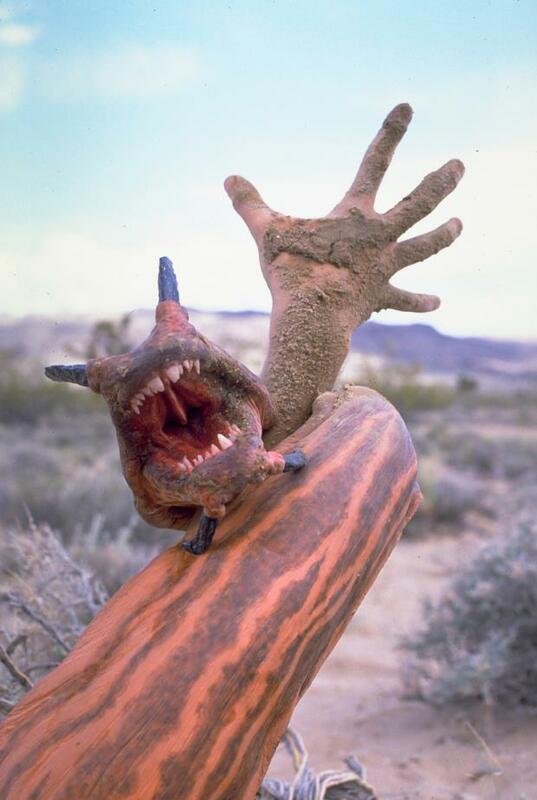 The Graboid tentacle hand puppet during filming. Maddock also suggested the use of a hand puppet, a device that unexpectedly proved very useful during shooting. “He said, ‘what about a hand puppet? '” Gillis said. “‘You know; don’t you think we should have a hand puppet?’ We sort of said, ‘okay, we’ll have a hand puppet.’ We used that hand puppet more than we ever expected!” Woodruff added: “the hand puppet was used for close-up shots — like where the tentacle is snapping at the truck. Any of the finer movements like grabbing or snapping was done with the hand puppet. It was better for those kinds of things than the cable-operated ones because it was more maneuverable.” ADI also built nine stunt tentacles, devoid of any mechanical features. Additional gore for other scenes, such as when the third creature is killed, was achieved with latex patches and pantyhoses, both filled with orange methocel to simulate the blood. 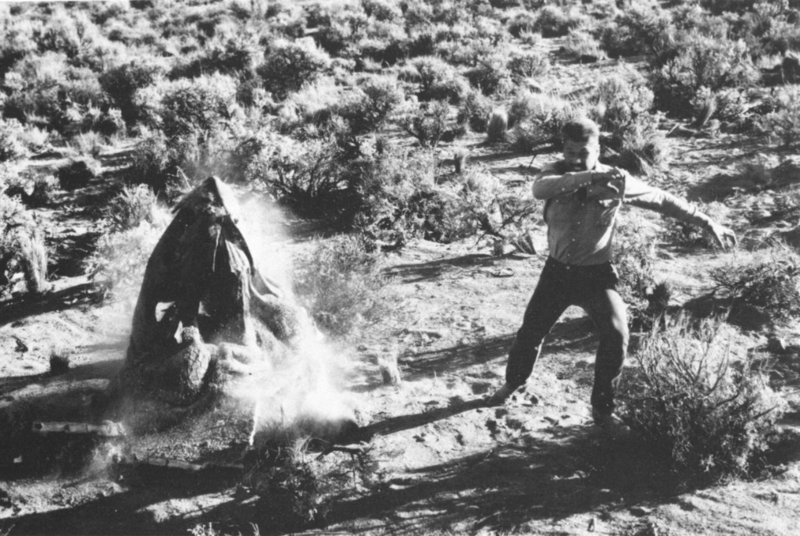 For the scenes where the Graboid intestines and other entrails are shot towards the characters, air cannons were used to shoot them. Miniatures, in fact, were used for actions and movements that the full-size creatures could not perform — or could achieve with certain restrictions. The miniatures allowed for more creative liberty in the sequences for which they were employed; in fact, the miniature work was so exceptional that the final film employed far more than originally intended, creating a whole second part of miniature shooting after the initial one. 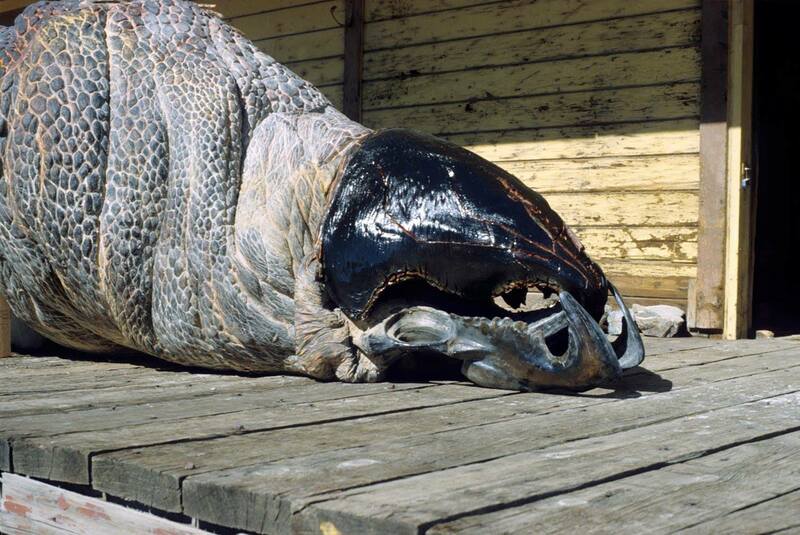 Close-up of the 1:4th scale animatronic’s armored head, which carefully reproduces the full-size Graboids’. 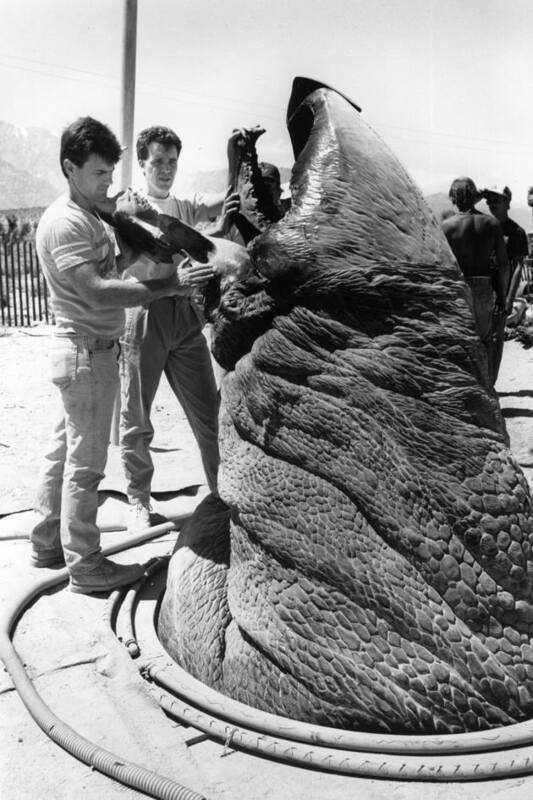 To achieve the gun shots on the Graboid, pre-cut holes in the creature were covered with patches of skin and then filled with air lines. A BB gun was then used to create hits on the ground and the Monster. For the shots of the Graboid traveling underground, a slot was cut into the table and covered with a foam rubber membrane. Thin foam-core plates were glued to said membrane, to simulate surface dirt. A pipe was moved through the underside of the rubber to achieve the effect of the ground heaving and cracking and settle back at the passage of the Graboid — which was maneuvered from below. Fuller’s earth, microballoons and miniature roots were added to enhance the effect. 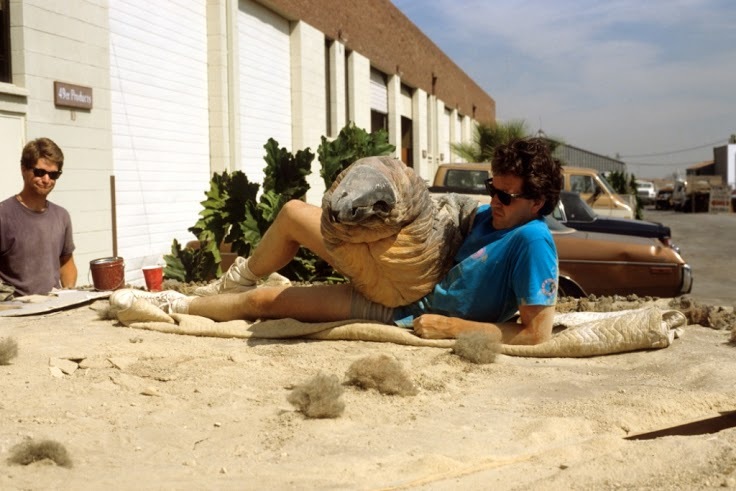 Tom Woodruff Jr. with the ‘ramming’ Graboid hand puppet, about to strike the miniature landscape. 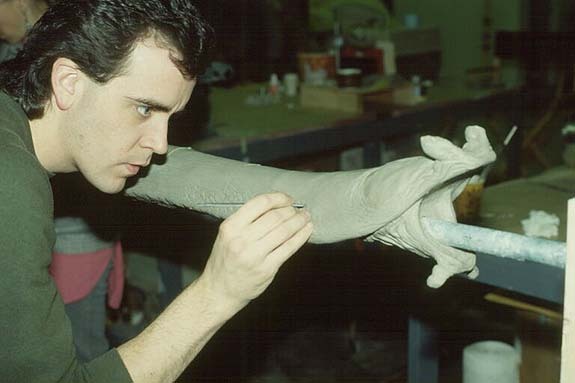 As production progressed, the special effects crew found that the miniature animatronic could easily be replaced by simpler models — hand puppets. “Originally we expected that [the 1:4th scale animatronic] would do all of the quarter-scale work,” Gillis said. “But once we got into it, we realized that we needed something easier to handle — which is when we began making different hand puppets. We needed one to crash up into the ceiling in Burt and Heather’s basement — just a hand puppet with the mouth closed. Another one had an articulated head that was used for a lot of the stuff. We just built a variety of puppets that we could pick and choose from depending on what was needed.” Shots of the creatures heading down to the ground and other key sequences were achieved with the hand puppets. Robert Skotak films the miniature Graboid hand puppet. 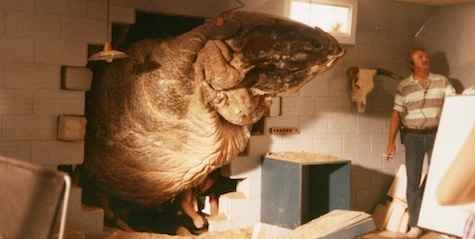 The basement scene was technically the last intended miniature shoot; when Tremors was shown in its rough workprint for the studio, Universal executives were enthusiastic about the creature effects — to the point where they authorized an additional budget to increase the creature effects shots. “In the rough cut, the creature had been shown only obliquely in many instances,” Robert Skotak recalled, “its presence suggested by moving clouds of dust and rumblings and windows shattering. Now the idea was to go in and add another 16 or 18 shots to flesh it out. This time we decided to shoot indoors because it was now late into August and the days were getting too short to shoot outside.” Unlike the ‘phase one’ miniatures, the ‘phase two’ ones would be shot in artificial light. despite concerns, the Skotak brothers achieved perfect matches with the live-action footage. Among the sequences was the shot where the Graboid is seen circling the boulder on which Rhonda, Val, and Earl are confined. “Ron felt that he needed to establish at least a couple of shots where you saw a shape come out of the sand and then go back down again,” Robert Skotak said. “He felt he needed that to sell the idea — a down-angle of it coming out and then the hole filling up after itself.” A mixture of fuller’s earth and colored microballoons was used to simulate the sand and the environment. A featureless 1:8th scale puppet was built by ADI and maneuvered from below through crescent-shaped slots cut into the set. “On both sides of the crescent there were chambers,” Robert Skotak said, “like drawers — full of microballoons and fuller’s earth, and as the creature rose up the hill in its path, someone on either side would be feeding in new soil mixture to bring the level back up to normal as it dove down at the far end.” Air lines eased the creature’s traveling. An additional shot of the Graboid rearing its head to grab the shovel was achieved with the hand puppet. A dual scale shot used both the quarter-scale puppet and the eighth scale puppet, and was achieved with forced perspective — when the camera passes from the former to the latter model. Fuller’s earth was blown diagonally across the set to help achieve the effect. 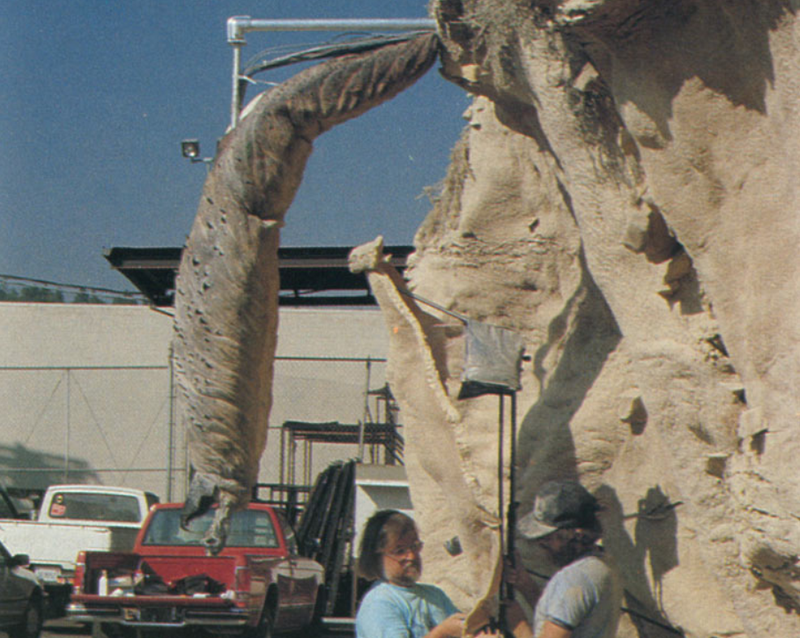 Additional Point-of-view shots were filmed, showing the Graboids’ travel through the ground: dirt and lightweight rock props were shoved into a vertically-placed camera. Can you fly, you sucker? Can you fly? At the end of the film, the last surviving Graboid is lured through the side of a cliff when Valentine McKee throws a bomb right behind it — thus making it accelerate for the intense sound. The Monster breaks through the cliff wall and meets a gruesome demise, falling into the canyon floor. 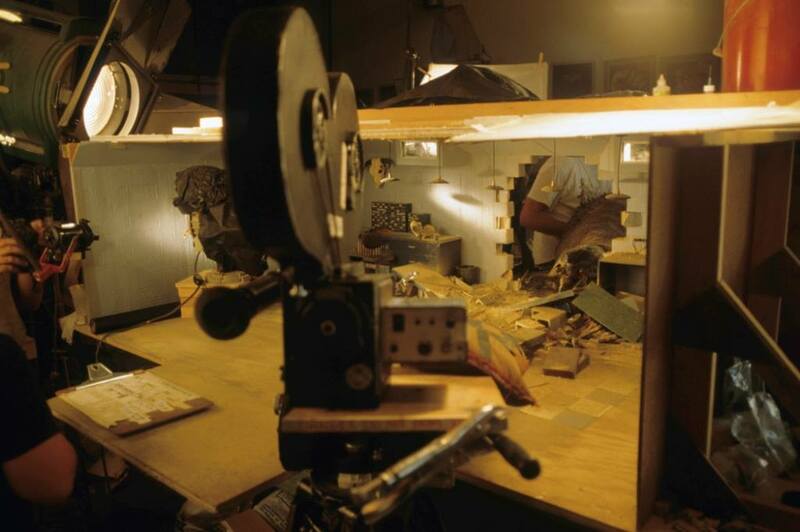 A highly realistic 1:4th scale miniature cliff was built for the sequence, which was part of the initial portion of miniature shooting. “Steven and Brent and Ron were very much into desert geology and they really wanted everything to make sense from a geological standpoint,” Robert Skotak said. 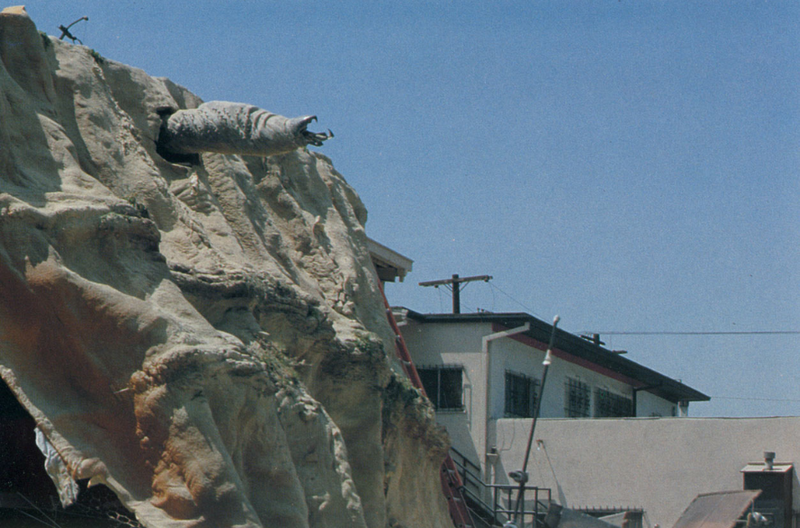 To make the Graboid break through, a hole was cut in the side of the model cliff — and a ramp was positioned behind it. The opening was then covered with wet paper toweling and portions of broken plaster and dirt. The creature was then placed on a cart that would be driven up the ramp and rammed through the covering. 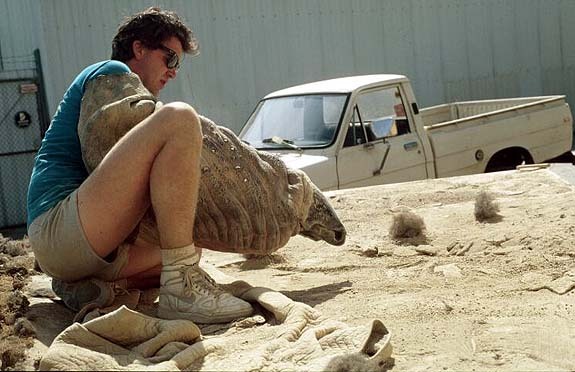 Tom Woodruff checks the ‘splattering’ Graboid before a take. The Graboid evidently could not fly. 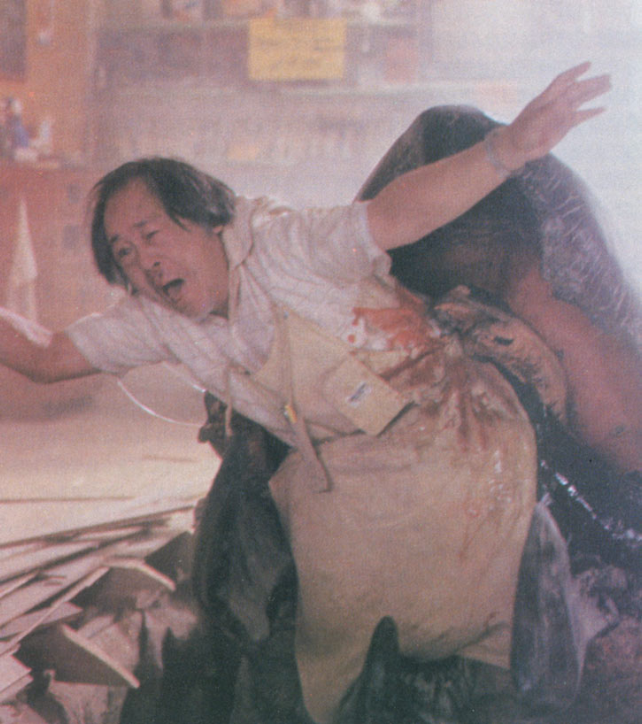 For more images of the Graboids, visit the Monster Gallery. 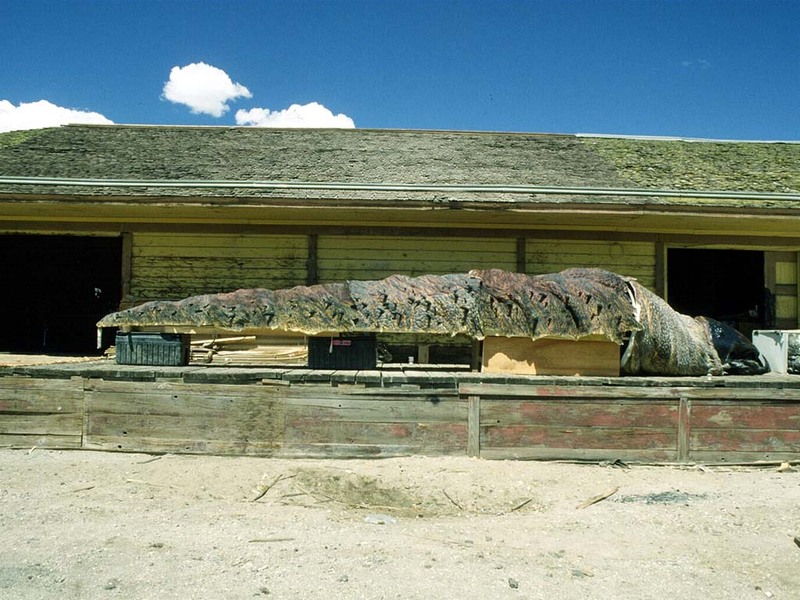 Posted on 20/09/2014, in Movie Monsters and tagged Amalgamated Dynamics, Graboid, S.S. Wilson, Tremors. Bookmark the permalink. 2 Comments.